The following table is a listing of gravestones in the Old Holt Road cemetery. 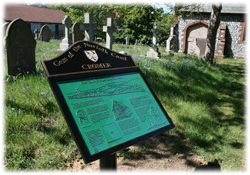 The details of the Cromer graveyards are given in A Dictionary of Cromer and Overstrand History. Visitors to the site will find the panel shown in our picture will help with further information. Please note that the list below ia both an incomplete listing and that in some instances information is too worn to be legible. Even so, we hope it will be useful to family historians. Burial records are available at Cromer Town Council. daughter of James & ?? May 1866? wife of William Aged 61? 7th September 1900 wife of James Charles aged 76? 5th December 1894 husband of Mary aged 48? ?9 May 1912 wife of Charles aged 65?